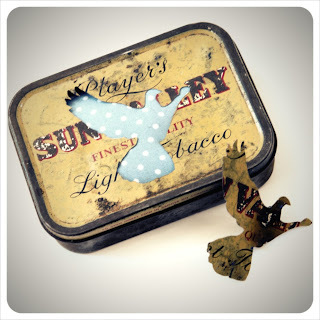 The Craft Guerrilla gals are born magpies...we love pretty,reinvented and quirky things! We first came across The Aviary last year and even featured them in our zine. 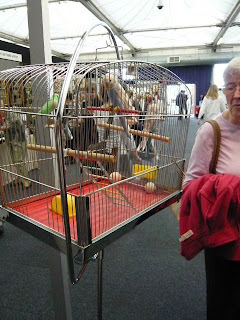 But it was last summer that I met the lovely Aviary gang at the "Art Boot Sale" in Brick Lane. Strangely I was drawn to their beautiful fineries before I even noticed it was them! 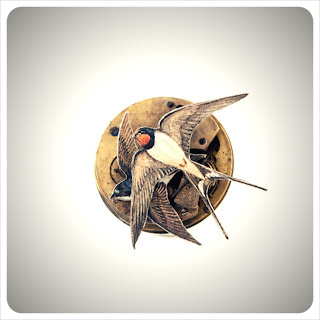 Of course the swallow brooch caught me eye and as I looked at it I was thinking "wow that reminds me of the Aviary's stuff!" Surprise...It was! So let me introduce you to them and for those that already know about them, sit back, grab a cupper and get reacquainted! Having begun as a pleasurable past time for Ben and Victoria, two young, indecisive (and flat broke) fine artists, The Aviary has quickly blossomed into a fledgling small business. We graduated from art school in 2006 and have kept up our fine art practices, individually making one off pieces of work ranging from small drawings to site specific installations, but have often found that the real pleasure in creating is the hands-on ‘doing’. Both of us have always loved all things vintage and preloved, spending a lot of spare time and money trawling through charity shops, second hand stores, flea markets, bootsales and, of course, eBay. Subsequently, our house and studio are packed full of out-of-date maps, retro knitting patterns, old books, field guides, anonymous sepia photographs, clock faces, vintage fabrics and odd buttons. The Aviary brings together our passion for collecting and making. Turning old into new, through redesigning, reinventing and finally rehoming. All of our items incorporate preloved, reclaimed and recycled materials that, wherever possible, have been sourced locally and saved from becoming unnecessary landfill. Our range is continually evolving, but we specialize in handmade, decorative home-wares, gift items, stationery and original, affordable jewellery utilizing our treasure trove of vintage ephemera. 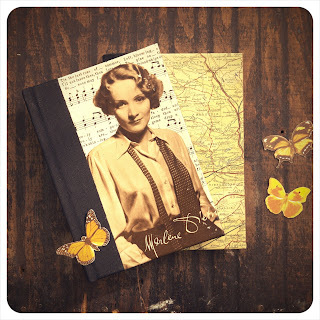 Popular products include hand-bound journals, diaries, notebooks and cards, as well as pin-badges and brooches. 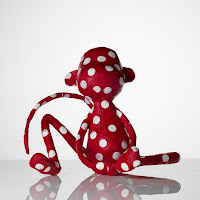 We also love working to briefs to create bespoke items and encourage people to come to us for unique gifts. There’s nothing more rewarding than someone being delighted with one of our handmade items. 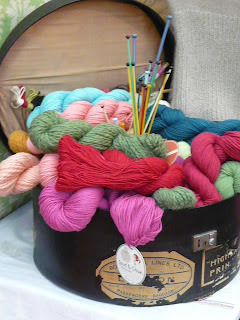 This week I've got a suitcase full of wool, knitting needles and crochet hooks (yes, literally!) and I'm flying to Dublin on Wednesday to teach some workshops and have a bit of a Irish jig! We've selected four Irish designer makers who will be exhibiting and selling their items at the show and I'm very excited to introduce them to you now. 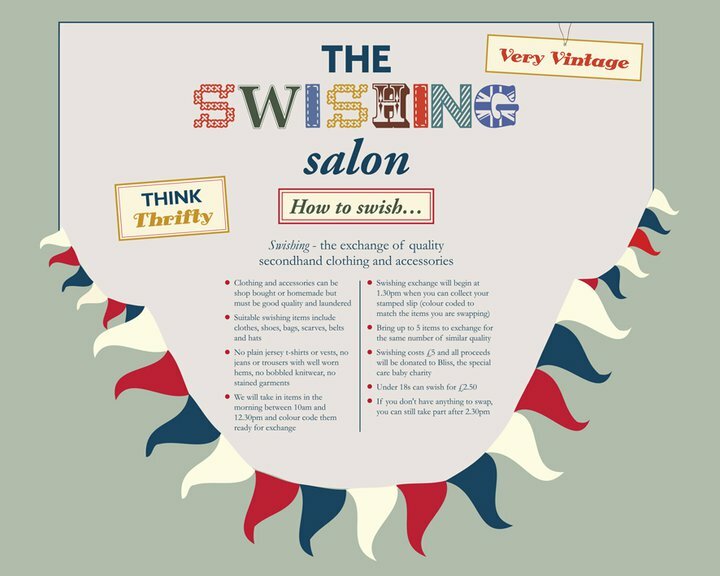 There will also be a Swishing Salon (see this post from the London blog entry for all the details about how to swap, what to bring etc) with a small fee being charged to swap with all proceeds going to support the Innocent Big Knit and Age Action Ireland. We will also have various 'cusomisation stations' where you can learn different techniques to upcycle, recycle, embellish, accessorise and generally breathe new life into your wardrobe. We are still looking for Dublin based designers and other crafty minded people who might like to help out either in the swishing salon as an extra pair of hands or if you have a great idea to help people recycle/upcycle or customise their clothes and have an hour or two to spare on one of the days of the show then please let us know by emailing craftguerrilla@gmail.com by Thursday 28th October. Please pass this request on to anyone you know who might be interested in helping out. Thanks! Hope to see you at the RDS in Dublin from 28th to 31st October! Thank you so much to all that applied. We've had a huge amount of requests and we've booked people in order we received them. We're really sorry if you haven't been successful but we were fully booked in record time. Literally hundreds of requests greeted our inbox...there's just too many talented people out there! Because everyone's pre vetted we have quite a lovely selection and variety of hand made goods. We hope you'll try again next year throughout the summer and next Christmas too. However we'll be putting people that haven't made it through onto the reserve list so you might be in with a chance! There's a new kid in town and it promises to change the way we sell hand made goods. Designer makers keep reading. 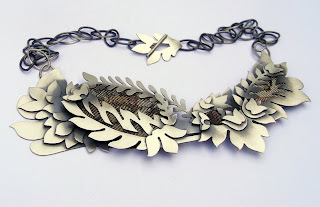 CraftNation.com is a showcase for artisan craft designers to show and feedback their designs to a worldwide audience. CraftNation.com features the best of these designs and sells them through it’s London based web boutique. The vision behind CraftNation.com is to challenge traditional supply chain methodology. Products which have the potential to be future-vintage artisan crafts, can be pre-ordered. Drastically reducing manufacturing waste and intern enhancing an ethically supported supply chain. You design handmade, artisan gifts, CraftNation.com process the orders. 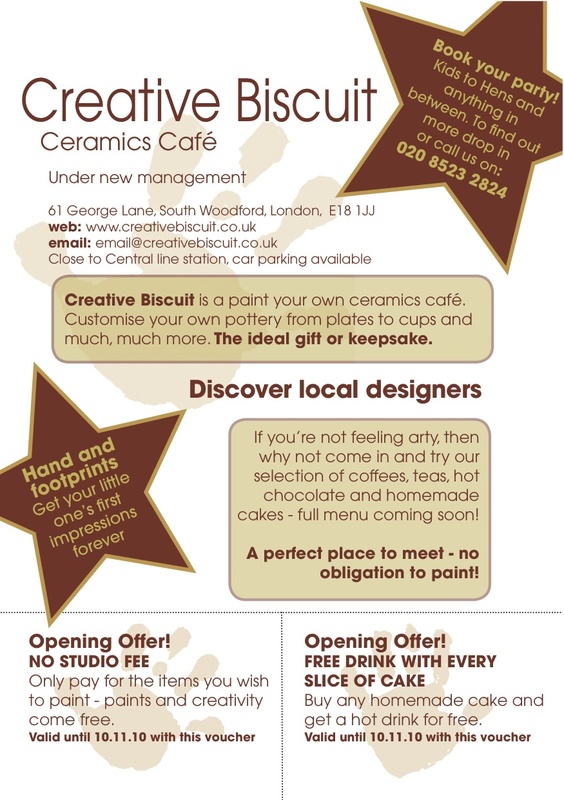 Our very own Craft Guerrilla Karen Dunn aka Creme Anglaise has ventured into the wilds of South Woodford to set up her very own craft cafe. 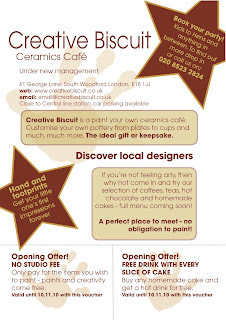 At the moment she's taken over "Creative Biscuit" an established ceramics cafe but come the new year she'll be re launching it as her very own creative space cafe. With a selection of craft workshops, designer maker items, hand made gifts, hen and birthday bookings accompanied by lovely cakes, tea and coffee! So if you're in the mood to make something go and check it out!!! ALSO if you're not planning to make anything you're very welcome to come and eat,drink and enjoy the creative space. Candid Arts Art & Design Fair is now on! I usually go every year and as usual the selection of designers doesn't disappoint. A splendid showcase of high quality,desirable hand made wares that will have you reaching for the purse. If you're already thinking about Chrimbo...go! It's just around the corner from Angel Tube station and a hop and a skip from Islington on the Victoria Line. You won't find hoards of shoppers elbowing their way through the stalls,the shopping is relaxed and friendly. It's not quiet but it's calm...the kind of atmosphere I like to shop in. You can take your time, browse, look without feeling you're in some one's way and you can even talk to the designers! You'll find absolutely gorgeous gifts and lots of temptation. Personally the intention was to go shopping for others but...I ended up treating myself! Thanks to everyone that visited, made,swished and crafted alongside the Craft Guerrilla! Don't forget that we'll also be in Dublin and Harrogate. Tic Tac Toe are currently looking for 6 stall-holders to set up from 12pm-6/7pm on the day, selling all types of arts and crafts. Once again, Etsy will be on board with Tik Tac Toe and will be buying items from stall holders that will then be given away at the end of the night in our rounds of bingo. If you, or anyone you know would like to apply for a stall please email me your name, mobile number, Etsy store link and some pictures of products that we can use on our facebook site. As an added incentive, we will be making booklets for the event in which we will feature all the stall holders selling on the day. This will include profiles of the people and their products, which will be handed out to all the punters on the day and left around the venue. Also in the booklets will be written pieces about everything from craft to music to fashion to London culture and anything and everything in-between! 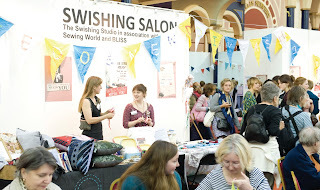 The Craft Guerrilla gals and guests will be on hand at the Swishing Salon at the K & S show in Ally Pally. What a fab venue...it's Victorian style and charm will no doubt inspire you to decorate,customize and beautify you're swishing booty! Dig out any good quality garments or accessories and bring them along to the Swishing area some time during the morning. From around 1.30pm, you can return to the area to exchange for the same number of items you donated. We ask for a small donation to Swish, but all funds raised go straight to Bliss, a charity for premature babies, so it's all for a good cause. Even if you're short of items to exchange, the Swishing Salon will be a hive of activity with experts including Mrs Bear, Sissy Rooney, Barley Massey and Craft Guerrilla all demonstrating various customising techniques. Brother are kindly supporting the event and have provided sewing machines and Coats Crafts also have some demonstrators involved, so make sure you drop by and see what all the fuss is about! Because we know how important recycling is to all you lovely Craft Guerrillas we are happy to pass on this competition...GO ON,HAVE A GO. YOU MIGHT JUST WIN!!! We love BUST!It's by far one of the best Christmas events in the London diary.So if you fancy giving it a try we strongly advise you to get in touch now as places go pretty fast!!! 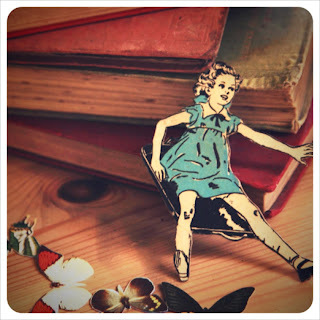 "The next Craftacular instalment is coming to town! The deadline is October 19." So finally after months of planning, designing and nail-biting decisions the Knitting and Stitching Show at Alexandra Palace is here. 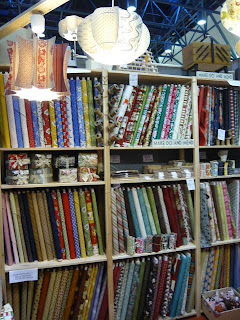 Starting next week on Thursday 7 October until Sunday 10 October from 10AM until 5.30PM (apart from Sunday when it ends at 5PM) there's a huge pile of crafty goodness available for you to peruse, try and buy! As you may remember, earlier this year Craft Guerrilla offered the opportunity for six designer makers to exhibit at the Knitting and Stitching shows in London, Dublin and Harrogate. We are very excited to reveal to you now the six London designers who will be showcasing their items and selling their wares to you next week at the Knitting and Stitching Show at Alexandra Palace. 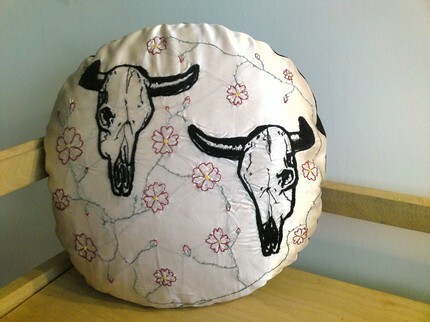 PEPPERMINT TWIST handcrafts quirky purses and bags in soft nappa leathers and fabrics. All are designed and meticulously made in London, in limited runs. DESIGNS are whimsical, playful, a little vintage-inspired, yet practical. Common elements are appliqués of horses, ponies, hearts and doves, star-shaped cut-outs, punched motifs, and studded decorations. PolkaDotSundays is the power of one woman on a mission, to make the world a more colourful place. 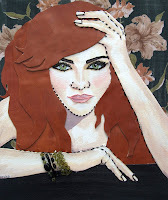 After graduating from Kingston University with a BA in Fine Art (2003), she worked as a prop artist on the childrens television art show, Art Attack. It was here that she discovered the magical possibilities of newspaper. Now, most of her personal works are made from the humble Sunday paper, transformed and recycled into polka dotted friends. 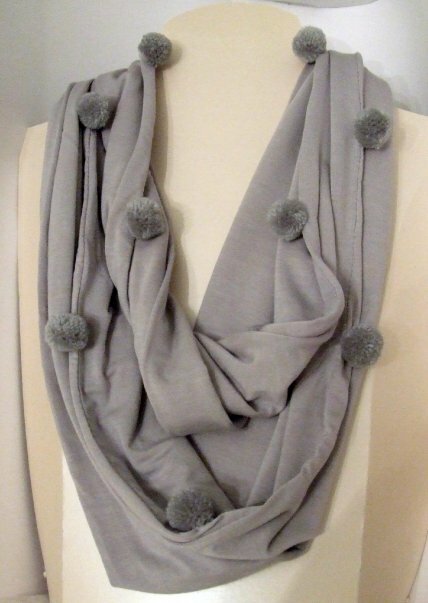 Boobou Designs create unique soft jewellery and accessories - every design is original and feels as good as it looks! 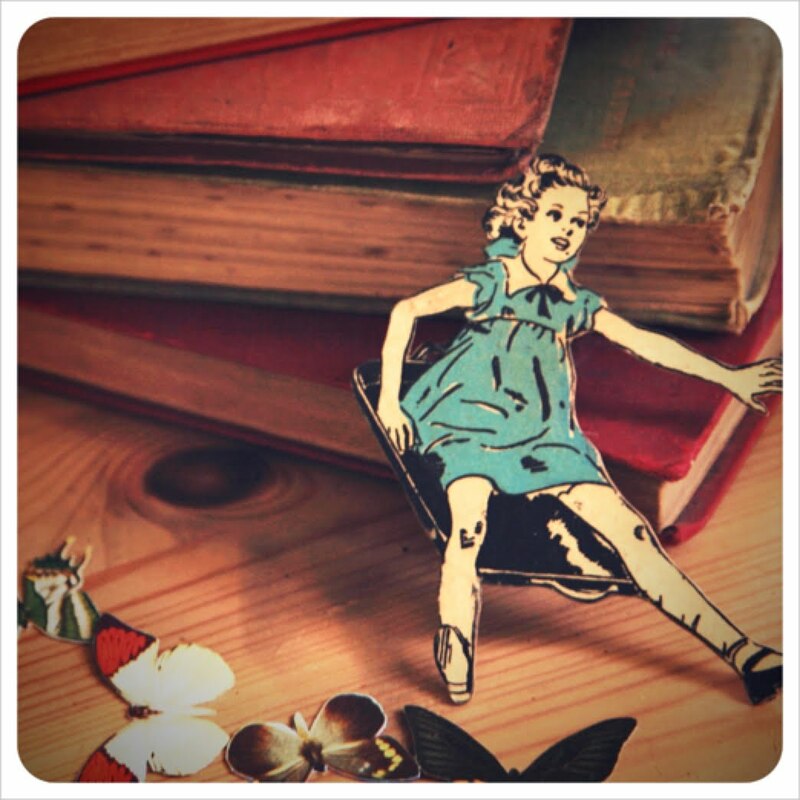 Boobou regularly sell at craft fayres and events in the north London area. We highly recommend you come and see us as the luxury of a Boobou design cannot be fully appreciated without touching one! Rosalind creates innovative knitted garments and accessories. Using a variety of unusual yarns, within a combination of complex hand and machine knitting techniques; each unique piece has a surreal edge and has been created to evoke notions of fantasy and escapism. Like delving into a dressing-up box, these pieces are made to provide enjoyment for decades, and to be loved, worn, and looked after for generations to come. 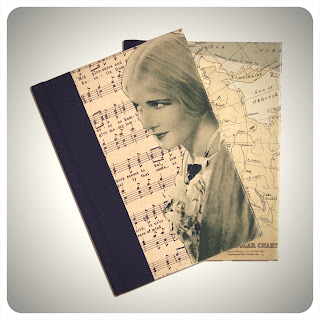 Forgotten Stitches is inspired by crafts from bygone eras and is dedicated to keeping these arts alive. Rebecca sells her items at vintage fairs and Portobello market. 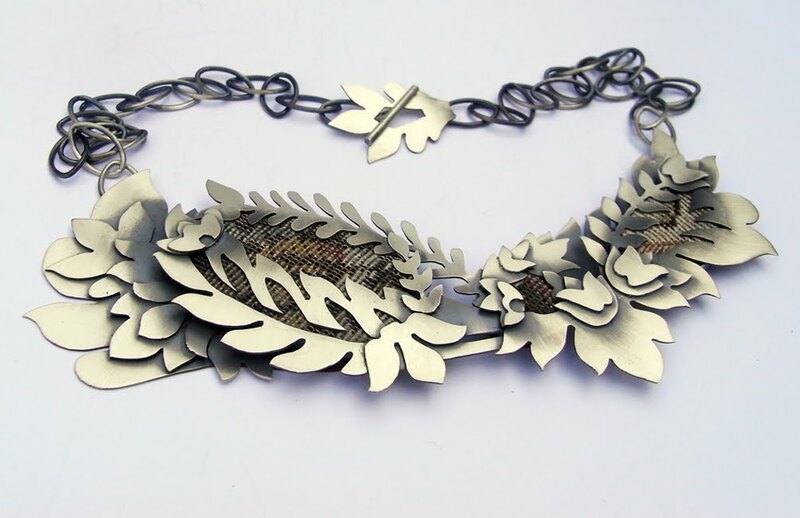 Her larger pieces focus homewards but she has recently been concentrating on producing a range of accessories as a result of several commissions. Sarah's work comes out of a Contemporary Crafts degree from Falmouth. She knits by a seventies hand-powered machine and uses a quilting technique to create her work. 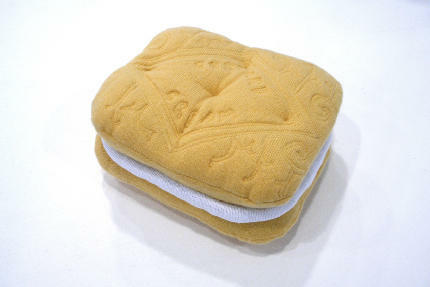 Her work is which is well-made, fun and playful - giant biscuits and such like. Craft Guerrilla will also be holding some workshops including beginners knitting, beginners crochet, upcycled t-shirt crochet fascinators (please bring along an old t-shirt to upcycle if you have one), upcycled t-shirt necklaces (again, please bring a t-shirt to upcycle) and beginners patchwork. Places are limited and advance bookings for Alexandra Palace have now sold out so please ask about places when you arrive. If you're coming to the Dublin or Harrogate shows then visit the twisted thread website to book your workshop place. Back by popular demand! The Swishing Salon returns to The Knitting and Stitching Shows, and this year we're bringing it to Dublin too! 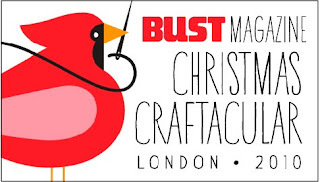 Queenie and Ted, Karen from Creme Anglaise and Lindsey from Boobou Designs will be helping out the Craft Guerrilla team with their unique customising tips and tricks. 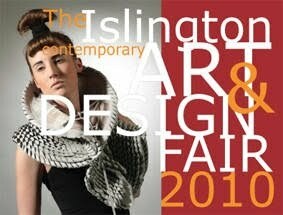 Watch this space for details of the Dublin and Harrogate designers coming up at the end of October and November.